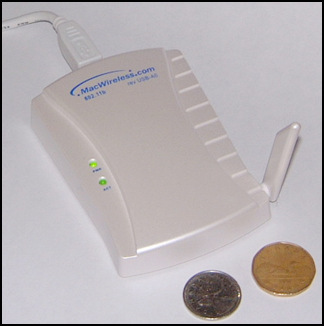 The MacWireless 802.11b USB Adapter! I recently had the opportunity to test drive a MacWireless 802.11b USB Adapter. It's a neat idea, a wireless card in a compact form factor, that just plugs into your USB port. 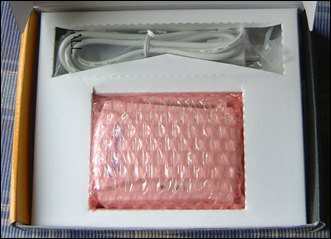 The MacWireless USB Adapter works for all Macintosh computers with built-in or added USB port (also requiring Mac OS 9.0.4 up to 9.2.2). Unfortunately there are no OS X drivers yet, but they are slated for beta-release in 3rd quarter, 2003. The unit is also compatible with Windows 98, ME, 2000, and XP. And bonus, there are also Linux drivers available! They will be up on the MacWireless site soon, or you can find them here. In my case, I wanted to add wireless to an older PowerMac 8600/300. It already had an added USB card in it, so I would have no problem with the USB end of things. I also liked the flexibility of being able to easily remove the wireless component and move it to another computer if I wished... to a cardless laptop for instance. The unit is nice and small (about the size of a deck of cards), and comes with a four foot USB cable. (MacWireless also sells longer cables in case you need one.) Installation is easy... just plug the unit into an available USB port... no external power supply is necessary. Drivers are included on a CD, or you can download the latest from the net. Install the drivers, restart, open the MacWireless control panel, then join your network. (You may also have to update your TCP/IP settings). Configuration of the unit is via the MacWireless Control Panel, which allows access to the unit's options, as well as your Mac's network control panels via a handy menu. There's also a Signal Strength bar, and Status indicator. From a pop-up menu, you have the option of Selecting the Best network, Selecting from a List of available networks, Selecting Other (encrypted networks for instance) or Creating Ad Hoc peer to peer network of computers within range. And for those who love such geeky things, there's also a Statistics window. The adapter worked very well, and I was happy with its performance. Using an original blueberry iBook, I didn't notice any significant speed differences when switching between the built-in Airport card and the USB adapter. WiFi range was also comparable. I found the USB adapter didn't have quite the range of an original airport card, but it was fairly close (within a few feet). I did notice however that the USB adapter seemed a little more susceptible to physical obstacles, according to the Signal Strength meter. I had some issues while using the USB adapter on the PowerMac 8600/300, which we use here at Geek Culture Headquarters to run our webcam. While using it with EvoCam, or when keeping the Control Panel open, the computer was much more likely to hang than with a standard ethernet connection to the web. Switching to another webcam software, Oculus, seemed to solve this problem though. Well, if you have the slot for a regular AirPort card or other built in wireless card, you'll probably want to use that, but if you have an older desktop G3 or early G4 (the Yikes family), especially one that has USB already, this unit is just the ticket to get WiFi fast. The fact that you can easily switch it over to other computers is also a plus. Hardware requirements: USB-equipped Mac running Mac OS 9.0.4-9.2.2 , (Mac OS X drivers slated for beta-release in 3rd quarter, 2003), or Windows 98, ME, 2000, and XP. Linux drivers here. An easy to use, compact unit, that works! Hopefully OS X drivers will be available soon. 4.0 Geeks out of 5 Geeks! MacWireless also sells a PCI Card solution, which is said to have a better range than the USB adapter. It uses a 100 milli-watt PC Card, allowing your machine to be further from the access point, but according to their website, there are no performance differences between the two solutions, since USB is fast enough to handle the 802.11b. For me, it was a good solution, and my beloved beige Mac was finally freed from the heartbreak of the ethernet cable. The 802.11b USB Adapter is available for $99.98 at a number of online retailers, including the MacWireless website. Back to the main Reviews.